This recipe makes 9 to 12 large or 24 miniature muffins. 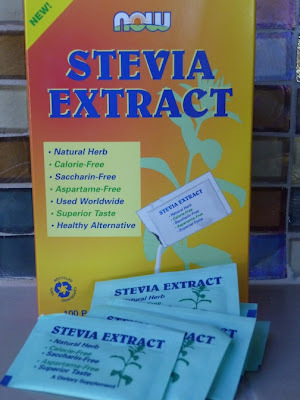 Stevia is a natural herb and a safe replacement for sugar. This recipe fills 2 miniature muffin pans. Perfect size to accompany a large Thanksgiving feast. Although no one needs bread on Thanksgiving with all of other dishes, we often feel compelled to serve it. One way to prevent over-eating these treasured carbs is to serve them in a "miniature" package. 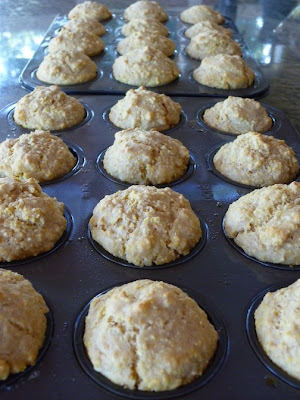 In this recipe, I use miniature muffin tins which allows me to get 24 muffins out of same amount of batter than yields only 9 to 12 regular sized muffins. If you put a large muffin on your plate you'll probably eat it even if you're busting at the seams. If you put a miniature muffin on your plate, you'll get the joy of having some extra carbs with only a fraction of the damage. Most likely, you won't go back for more. Stevia is an herb which has been used to sweeten beverages in Paraguay and Brazil since pre-Columbian times. It's popular in many parts of the world but has been kept a "secret" in this country, in my opinion, by the artificial sweetener and sugar lobbyists. It wasn't until recently that the FDA granted GRAS approval to stevia so that it can be used in "food and beverages" and not just as a "supplement" for which it was previously approved. With its popularity around the world, it has been used in large quantities for many years and has been shown to be completely non-toxic unlike many artificial sweeteners on the market. When baking with stevia, you do not have the "volume" that you get when using sugar. 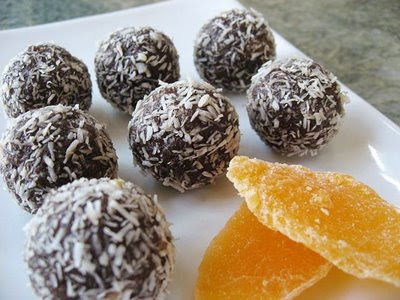 In this recipe, I replace 1/4 cup of sugar with 6 (1 gram) packets of stevia, 2 tablespoons of applesauce and 2 tablespoons of oat bran. The applesauce and oat bran make up the missing volume nicely. As my blog readers know, I think fiber consumption is one of the most important things you can do for health and longevity. 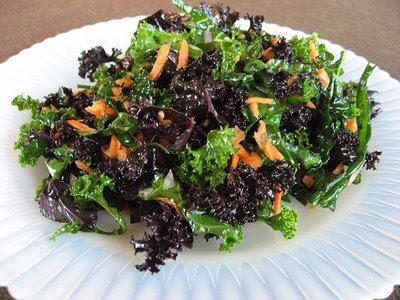 This recipe is made with "King Arthur White Whole Wheat Flour" which gives you the delicate mild flavor and light color of white flour but all of the fiber and nutrition of whole wheat. I also use whole grain cornmeal which, I must admit, gives you a very grainy texture. If you don't like the texture of whole grain cornmeal, you can substitute degermed cornmeal but you will not get as much fiber. Try the whole grain cornmeal and see what you think. Preheat oven to 425 degrees. Grease 2 miniature muffin pans that hold 12 muffins each. 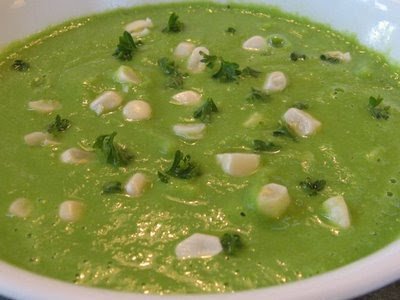 Place all ingredients in a mixing bowl and blend. Divide batter into 24 miniature muffin tins and bake for 9 minutes or until an inserted toothpick comes out clean. You can also make 9 to 12 large muffins but they will have to cook a little longer, about 12 to 15 minutes. You can also put the batter into an 8 inch square pan and bake 20 to 25 minutes. Per miniature muffin: 63.9 calories, 2.8 g fat, 0.5 g saturated fat, 9.3 mg cholesterol, 1.8 g protein, 7.9 g carbohydrates and 1 g of fiber. Preheat oven to 425 degrees. Grease 2 miniature muffin pans that hold 12 muffins each. 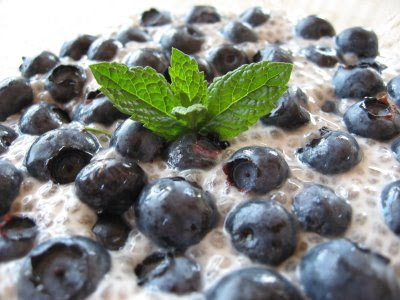 Place all ingredients in a mixing bowl and blend. Divide batter into 24 miniature muffin tins and bake for 9 minutes or until an inserted toothpick comes out clean. You can also make 9 to 12 large muffins but they will have to cook a little longer, about 12 to 15 minutes. You can also put the batter into an 8 inch square pan and bake 20 to 25 minutes. When using EnerG egg replacement, bake the muffins immediately after preparing the batter. If they sit around a while, they may not rise properly. Per miniature muffin: 60.5 calories, 2.7 g fat, 0.4 g saturated fat, 0 mg cholesterol, 1.5 g protein, 7.5 g carbohydrates and 1 g of fiber. 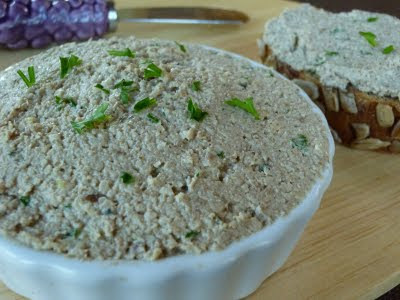 This veggie pâté has a rich and meaty taste and makes a great appetizer for any guest whether they love to eat meat or avoid it completely. Compared to pâtés made from chicken or goose liver that contain little or no essential fatty acids while being high in cholesterol, this recipe provides 683 mg of omega 3 and 2,891 mg of omega 6 per tablespoon and has zero cholesterol. And once you've soaked the walnuts, it only takes minutes to prepare. Rinse the soaked walnuts and drain well. Put them in a food processor with an S blade together with mushrooms, Nama Shoyu, garlic, thyme, black pepper and olive oil and process until smooth, scraping down the sides when needed. 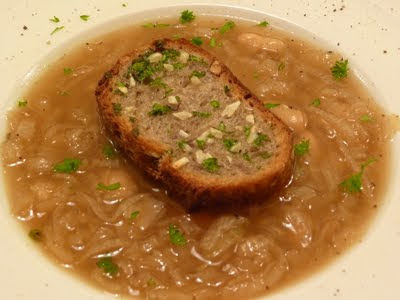 Add minced onion and parsley and process briefly. 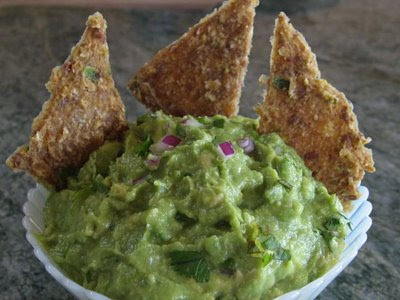 Serve as an appetizer with a whole grain vegan baguette or with raw crackers. It can also be used as a vegan sandwich filling. Per serving: 53.1 calories, 5.2 g fat, 0.5 g saturated fat, 0 g cholesterol, 1.3 g protein, 1.3 g carbohydrates, 0.6 g fiber, 683 mg omega 3 and 2,891 mg omega 6 essential fatty acids. A simple vegan antipasto appetizer. Vegan split pea soup with carrots. Vegan stuffed pumpkin with quinoa, pecans, cranberries and apples. Vegan lemon tahini encrusted baked cauliflower. 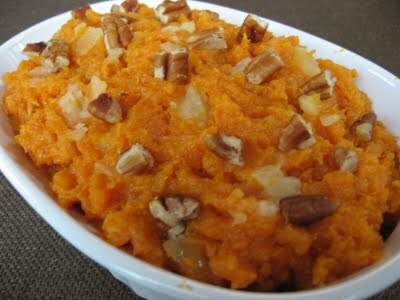 Vegan sweet potato casserole with pineapple and pecans. 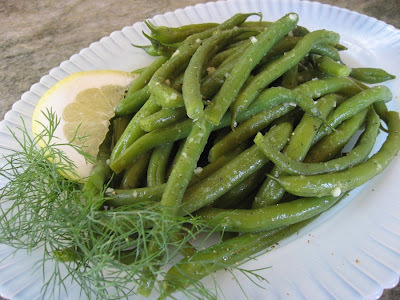 Garden fresh green beans with garlic, lemon and dill. 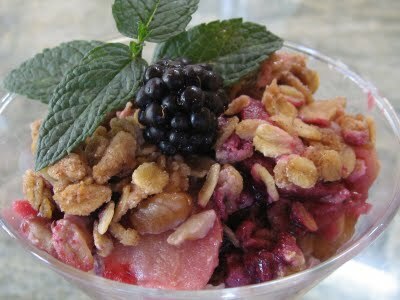 Vegan apple and blackberry crisp. 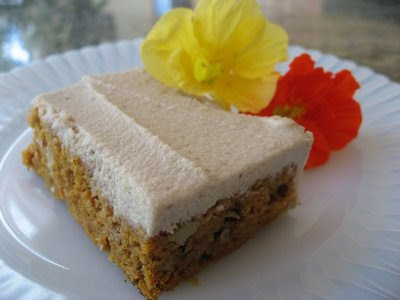 Vegan carrot cake with cashew cream icing. If you are hosting a Thanksgiving dinner and have some vegan guests, here's what you need to know. 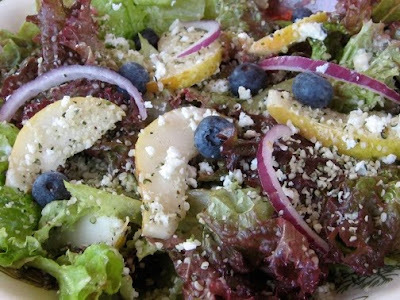 Vegans do not eat any animal products - besides avoiding meat, fish and poultry,(that includes broth made from turkey, chicken or beef), they don't use milk, eggs, cheese, butter and honey (although some vegans eat honey so make sure to check). 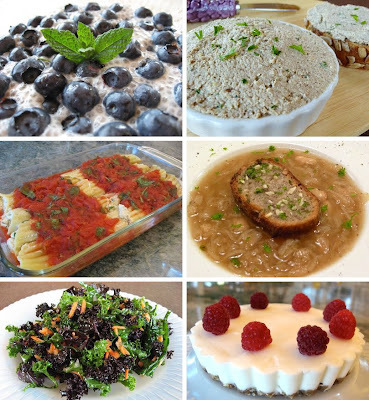 This menu provides vegan friendly recipes from appetizers to desserts. The quinoa stuffed sugar pumpkin makes a great main entree. Even if you aren't a vegan or vegetarian, these delicious dishes will make your Thanksgiving meal lighter and healthier. 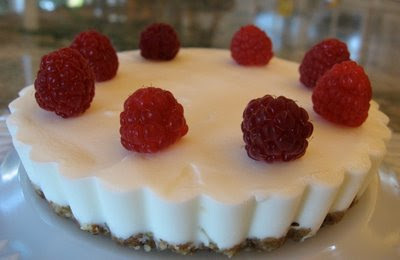 [Please click on the recipe titles to link to the actual recipes and then hit the back arrow to return to this posting]. 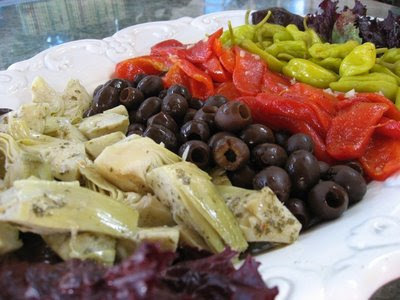 I love to serve a big Vegan Antipasto when we entertain. For the non-vegans, you can add baby buffalo mozzarella or chunks of provolone. This antipasto is very easy to make and can be assembled in minutes. 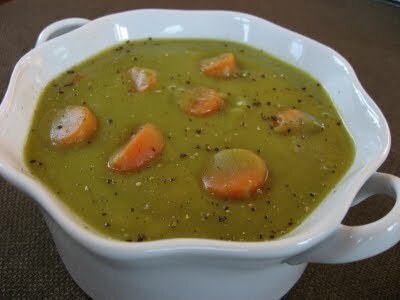 One of my favorite soups is Vegan Split Pea Soup with Carrots. You can make this ahead of time and reheat on Thanksgiving day. Or, make it early in the day and leave it in the pot. Set aside and warm it right before dinner. 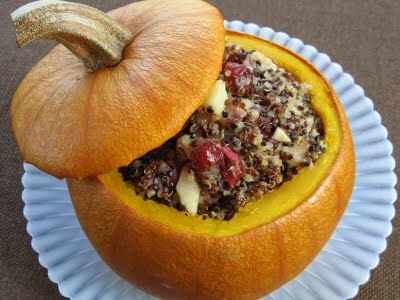 For the main entree we have Vegan Stuffed Pumpkin with Quinoa, Pecans, Cranberries and Apples. 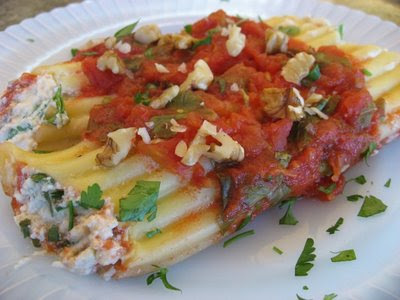 This is a very filling dish so if you make all the other side dishes, this recipe will serve 8. 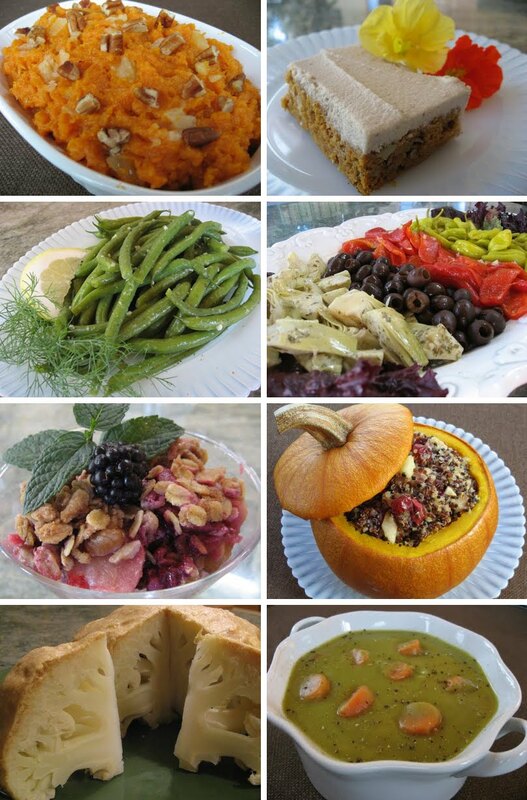 I've chosen 3 healthy and fairly easy side dishes to go with the stuffed pumpkin and/or with a traditional turkey. The first is Vegan Lemon Tahini Encrusted Baked Cauliflower. 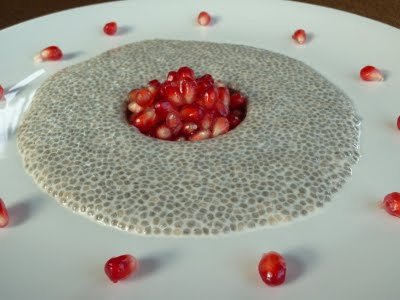 This dish makes a very elegant presentation and slices nicely. 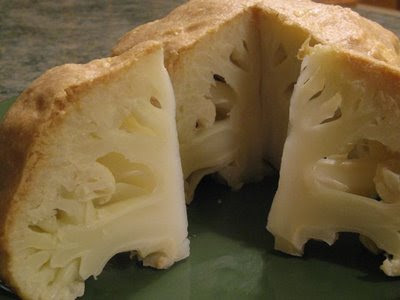 Although this recipe usually serves 4, with all the other dishes, a large cauliflower would probably serve 6 to 8. The next dish is Vegan Sweet Potato Casserole with Pineapple and Pecans. This light and healthy casserole will serve 8 and can be made the day before. The last side dish is Garden Fresh Green Beans with Garlic, Lemon and Dill. This recipe will serve 6 to 8. For dessert we have 2 options. The first is a Vegan Gravenstein Apple and Blackberry Crisp . Of course you can replace the Gravensteins with other apples and you can also replace the blackberries with cranberries or raisins. This recipe serves 6. The second dessert is Vegan Carrot Cake made with a cashew cream icing. The sheet cake can serve up to 30 people so if you have a smaller crowd, pour the entire batter in a 9"x13" pan, make only half the icing and just ice the top. 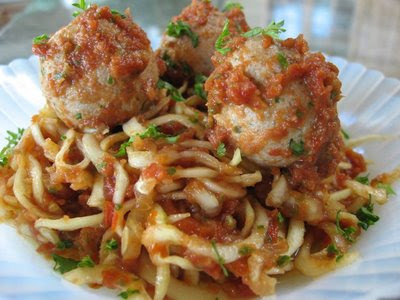 That will still serve up to 20 people but you can eat if for several days or send some home with your guests! Check out the 2010 Healthy Vegan Thanksgiving Menu! I hope you enjoy these menus for your Thanksgiving or other winter holiday feasts. 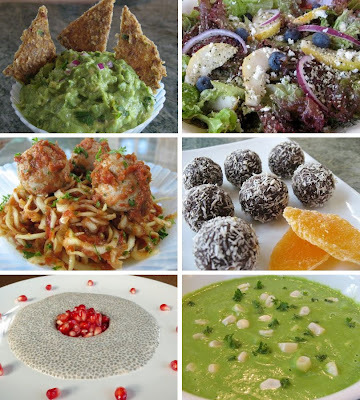 Check out more vegan recipes and articles on vegan nutrition on my blog.